The point-hammering method is used to set up wires or rods in preparation for drawing points for a subsequent drawing process. By means of rotating tools, a wire or rod is thereby reduced in diameter along a definite length. The transformation is performed by specially developed tools that bring the work piece into any desired form with coordinated horizontal and vertical lifting movements (hammering). Thus, hammer machines are used for the chipless shaping of wire, rods and tubes and provide for the manufacture of point drawing as well as for hot and cold reduction of tools and pipe-finished parts. KROLLMANN hammer reducing machines type HM – This type of machine is optionally built with rotating (2/R and 4/R) or stationary (4/R) tools. In this case, the 4/S machines have a special position, in which square or rectangular metal parts can be reduced to a round shape with additional rotation of the tools. This type of machine can also be produced with low noise level idle and damped working noise. KROLLMANN hammer reducing machines type EHM Machines of this type are especially used for hot reduction of three, hexagonal and special profiles and are driven with three, four or six eccentric driven stationary tools. 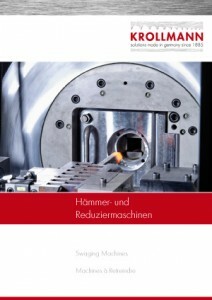 KROLLMANN hammer reducing machines types HM and EHM All types of machines can be equipped for semi- or fully automatic mode (+Z) and additionally with induction heating.